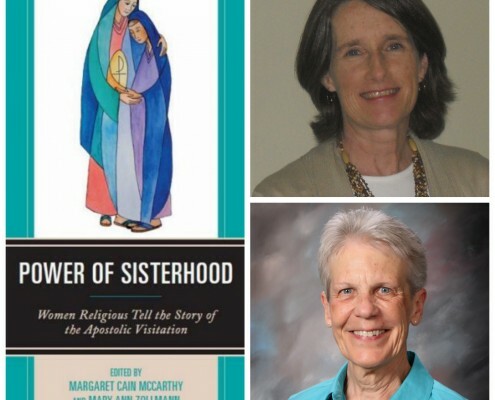 The co-editors of Power of Sisterhood: Women Religious Tell the Story of the Apostolic Vistation will discuss the dynamics of religious life that led to the Apostolic Visitation of U.S. women religious, the experience of women engaged with its various phases, and the significance of the event for women religious and the church in the future. Margaret Cain McCarthy, PhD, earned her doctorate from the University at Buffalo. She is a professor and associate vice president for academic affairs in the Department of Graduate Education and Leadership at Canisius College in Buffalo, New York. In July 2015, she will assume the role of vice presdient for academic affairs at Canisius. Margaret is the author of History of American Higher Education, a book in the Peter Lang Primer Series. Margaret is the proud mother of five, a graduate of the Ignatian Colleagues Program, and an associate member of the Sisters of St. Joseph of the Diocese of Buffalo. Mary Ann Zollmann, BVM, PhD, has been a Sister of Charity of the Blessed Virgin Mary for 57 years. She holds MA degrees in French from Purdue University and religious education from the University of San Francisco, and has an MA and PhD in spirituality from Duquesne University. Mary Ann has taught in high school and university, and has served in leadership in her BVM Congregation. She was President of the Leadership Conference of Women Religious. She currently serves on the Boards of Trustees at Clarke University and Loyola University of Chicago. As a bearer of justice and peace, Mary Ann has traveled to El Salvador, Ecuador, Israel and Palestine, Swaziland and Ghana, and Vatican offices in Rome. Her other publications include her dissertation, Exploring a Spirituality of Higher Education, and her LCWR Presidential Address, Claiming the Power of our Sisterhood. Email Kate at kate@waterwomensalliance.org if you have trouble registering or need more information. Thank you! https://www.waterwomensalliance.org/wp-content/uploads/June-10-WATERtalk-e1431440758463.jpg 270 270 waterstaff http://www.waterwomensalliance.org/wp-content/uploads/Screen-Shot-2018-11-01-at-12.15.34-PM.png waterstaff2015-05-07 14:43:462015-05-15 15:48:23June 10 WATERtalk, "Power of Sisterhood: Women Religious Tell the Story of the Apostolic Visitation"